“Who can say they’ve played both Katherine Hepburn and Bob Dylan,” said film critic Pete Hammond, giving examples of the challenging and risky roles Cate Blanchett has taken in her career. Range and risk were the themes of the evening as the capacity crowd at the Arlington Theater was treated to a nearly two-hour conversation between Hammond and the movie star that was engaging, funny, and revealing. For the past six years, Blanchett has essentially eschewed the silver screen choosing instead to stay in her native Australia and serve as creative director of the Sydney Theater Company. It’s impressive, Hammond noted, that she came back from her extended leave with such a brilliant performance in director Woody Allen’s Blue Jasmine, one that has her nominated for a Best Actress Academy Award. But it is her time working in theater, Blanchett asserted, that makes her able to find the voice of the challenging characters she plays; it’s the energy of the director and the cast working synergistically, she said, that teases out the best performances. “The role is secondary. It’s about who you are being directed by and who the other actors are.” And she would know—a review of her career shows the enviable array of top-notch actors and directors she has worked with to date. Blanchett told of her path to acting, saying she thought of it as a hobby, thinking she would make a career as an art curator. Still, she decided to go to drama school. She gave herself five years after graduation to see if she could make a living at it. “If I didn’t work, I’d go back to university,” she explained. “And I haven’t had to do that yet,” she said laughing. Through the course of the evening, Blanchett was articulate and thoughtful in her answers, charming and polite. The one blip came when a photographer scuttled up to the front of the stage and took rapid-fire pictures of the star, the sound of the camera’s shutter click echoing like a machine gun throughout the theater. “Do you have to do that?” asked Blanchett of the intrusion, a sentiment supported by the audience. A while later, the photog was at it again, disrupting Blanchett and Hammond’s interview and prompting a ruffled Blanchett to address him again. “Look, I’m not doing anything different than I was five minutes ago,” she said in wonderment as to why so many pictures were being taken. This time, festival director Roger Durling scolded the paparazzi; there were no more rude disruptions after that. 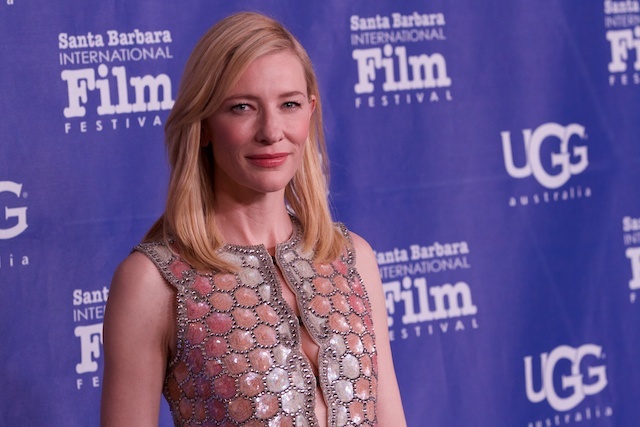 After Mara’s heartfelt speech, Blanchett thanked the SBIFF for choosing her for this award. She received a standing ovation.